A Cooking Bookworm: The "Real Food Project" by Hellmann's® and Chocolate Mayo Cake! The "Real Food Project" by Hellmann's® and Chocolate Mayo Cake! Very few products that I buy are brand name. My experience with most store-brand items have been positive, not to mention easier on my budget! However, I have a definite preference for brand names in regard to personal products, ranch dressing, and MAYONNAISE. And Hellmann's® is my mayo choice! Celebrity chef Bobby Flay (mine and hubby's favorite Iron Chef!) and actress/mom Lori Loughlin have teamed up with Hellmann's® and Best Foods® Mayonnaise to unveil the Real Food Project on Hellmanns.com, a comprehensive online resource offering tips and ideas on how to create real meals made with Real Food. Because videos are great for multi-tasking moms, The Real Food Project features a series of entertaining how-to tutorials, hosted by Bobby Flay, to give us tools and techniques to prepare great-tasting, at-home meals for our families. Just by visiting www.Hellmanns.com, you can access a wide range of recipes, including sandwiches, entrees and side dishes, all designed to please picky palates. There are even chances to WIN great prizes like a kitchen essentials bundle, Bobby Flay Grill It and Hellmann's® and Best Foods® products by playing the "Wheel of Real" instant win game and entering the Real Food Sweepstakes. So what are you waiting for?? Head on over to Hellmann's® Real Food Project for some amazing recipes like Ham Salad on Biscuits, Honey Mustard Chicken Fingers, or Asian Slaw. Here's another fantastic way to use Hellmann's® - a chocolate mayonnaise cake! Preheat oven to 350 degrees . Lightly grease one 9x13 pan. Mix flour, baking soda, baking powder, cocoa, and sugar into a large bowl. Stir in mayonnaise. Gradually add water and vanilla and blend until smooth. Pour batter into prepared pan. Bake at 350 degrees for 30 minutes. Cool. Slather with your favorite frosting! (I recommend peanut butter! Make your own, or I stirred 1/2 cup of peanut butter into a tub of cream cheese frosting -- delish)! 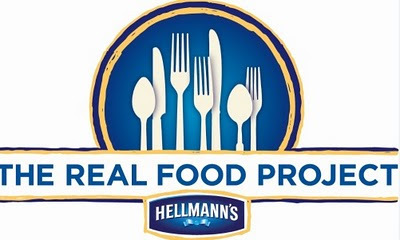 Thanks to MomSelect for the opportunity to share Hellmann's® Real Food Project with my readers!